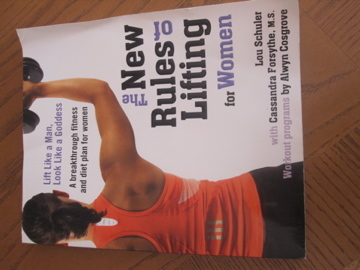 After reading Meghann’s rave reviews of the New Rules of Lifting for Women, I decided to pick up a copy for myself. I’ve been trying to incorporate more strength training into my routine, but really didn’t have a plan. I was doing exercises I thought I was supposed to do, but I knew there had to be a more effective way to build muscle and tone up. This book seemed like a great solution! The premise of this book is that there is no reason that women should lift differently than men. We have been traditionally told that we should lift light with high repetitions so we don’t “bulk up”, but really it is impossible for women to achieve a masculine figure because we do not have the same levels of testosterone. The book also focuses on doing exercises that replicate movements we make in daily life instead of isolating single muscles. It’s more effective to do a pulling movement than tricep kickback where you extend backward at the elbow. When do you really have to do that in real life? There is a discussion on eating and a suggested meal plan in the book as well. One takeaway from this suggestion is that it is completely contradictory to lower your caloric intake too much when you are trying to build muscle. Eating too little calories slows your resting metabolic rate (no one wants that), while building muscle raises your metabolic rate (a good thing), so it is important to continue to eat enough to fuel through the exercises and not slow your metabolism. As for the diet, it incorporates meat, dairy, and whey protein shakes. It was a pretty typical “healthy diet plan” but emphasizes eating frequently, especially right after a workout. The book then goes into the specific weight lifting plans. There are several stages with two workouts each (A and B). You are meant to start at stage one and do the workouts two or three times a week, alternating between A and B. After about 8 weeks, you move into stage 2. This continues until you finish the whole plan in about six months. Each workout isn’t extremely long which is a positive. The moves are detailed at the end of the book (as shown above). It’s really nice to have pictures and instructions on how to do the workout properly, especially when I don’t exactly know what a “prone jackknife” is. I found myself referring to this section for guidance often. I went to the website to print out workout logs. I have never kept track of workouts before, but if I want to do this correctly and make sure I am making progress. Increasing weights gradually is important – you should be working your muscles to fatigue, but not overdoing it so much that you can’t go on. 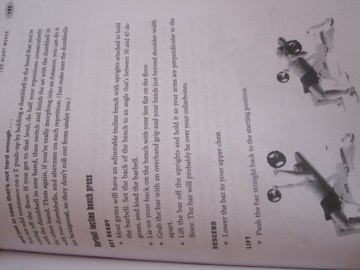 As for other workouts to do while on this plan, the book recommends High Intensity Interval Training. There is a discussion on why long distance running and endurance training isn’t effective, but I kind of took that with a grain of salt since I love my runs! The main thing is to not break down your muscles even further and tire yourself out so that you can’t complete the strength workouts. I’m not changing anything else about my routine cardio-wise, just replacing my old strength workouts with the ones in the book. I’ve only done four workouts so far, but definitely felt it after each one! I haven’t seen any specific changes yet and didn’t do any before and after measurements or pictures. I really want to build muscle the right way, but am not all that interested in how many inches I lose and gain. I’m also not following the diet plan so I’m sure that will affect my results. I’m not entirely sure if I’ll complete the entire six month program, but I hope to work with it long enough to make noticeable strides in my strength. The only downside I can find is that many of the workouts do require gym equipment. This isn’t good when I want to get in a run at home but then need to be at the gym to complete the strength work out. I’ve split up my workouts to solve this problem so far, and am not sure how I will handle it in the future. Overall: I love the book! Everything really made sense and got me excited to build muscle and do effective weight training. I’d recommend it to anyone trying to add strength training to their routine. Glad to see your review. I will be starting the plan soon and excited to see some improvements in my strength after doing the same basic routine for a year. Nice review! I got the book and started reading last week, love it and most definitely agree with the training and type of small meals plan they advise. Cool to see that you are doing the program, I want to try that too! I’ve really wanted to get this book, since now that I’m back in the states, I don’t have a gym with Body Pump nearby. I’m hoping to hear more from you on the routine, too! Thanks for the recommendation! I’ll have to add it to my library reserve list. I’m so passionate about strength training, but still have the Body for Life way of doing things in my head from 10 years ago! sounds like a great book! im definitely thinking of getting it! I have this book and started incorporating the diet piece (no additional whey protein, but more protein) and also the heavier weights. It took my belly fat off and I’m getting stronger! This is a great program, I just had a hard time adding food (protein specifically) , but it made a huge difference to my energy level and my muscle strength I’ve been doing it for about 6 weeks (no where near the 6 months). I’ve decided to stop weighing myself and am now focused on strength building and its been so great! Thanks for sharing! I’m a huge fan of this book as well. My mom has been weightlifting (she used to be a personal trainer) for ten years, and I bought it to supplement/reinforce the things she teaches me during our training sessions. Barring the meal plan (as I’ve noted in the past) I think it’s an excellent must-read for anyone looking to learn more about weight lifting. I disagree that it’s impossible to develop a masculine figure. I’ve watched very fit feminine girls transform into hulky girls at my gym, and they are always the ones with the 20lb dumbells. One of them realized what happened, went back to 10lb max and upped her reps. She said she was sick of looking like a dude. There’s a new book in this series that I highly recommend. It’s called The New Rules of Lifting for Abs and is written by Rachel Cosgrove’s husband, Alwyn, along with Lou Schuler. While not written expressly for women (there’s really no reason to train women that differently than you train men 🙂 ), the exercises focus much more on developing core strength, without which you’ll never be able to lift heavier without risk of injury. I’ve done the workouts in both books and like the second even more! I’ve seen lots of GREAT reviews of this book, and now I feel like I need to pick it up and read it. Thanks for the review, and I can’t wait to hear how your muscle-y progress goes! Thanks so much for the review! I was thinking about reading this book, but didn’t want to commit until I had a better idea of what was in it. This sounds like an awesome book! 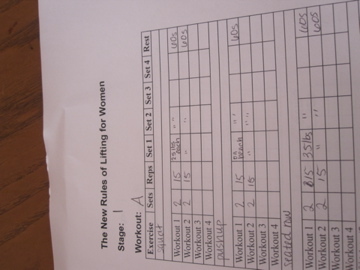 I find it helpful when I have a plan to keep me structured for strength training.